On January 14, 2001, we received a call from our local animal control shelter. 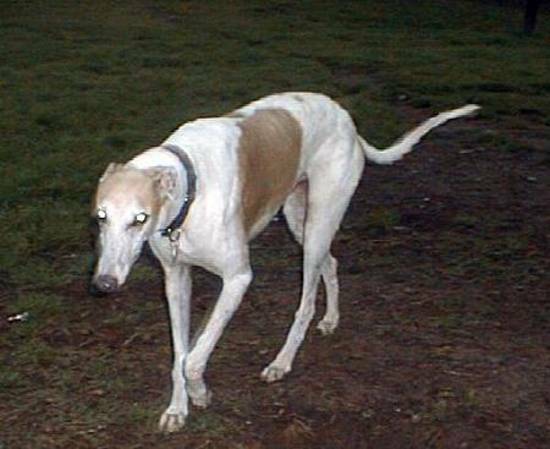 A greyhound had been picked as a stray - were we interested? Without questioning the dog's age or temperament, we immediately said "yes." 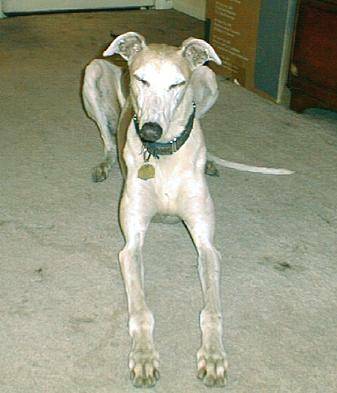 Since most greyhounds in this area are retired racers, we knew the dog must be tattooed and would easily be tracable. What we found when we arrived at the shelter was sickening. 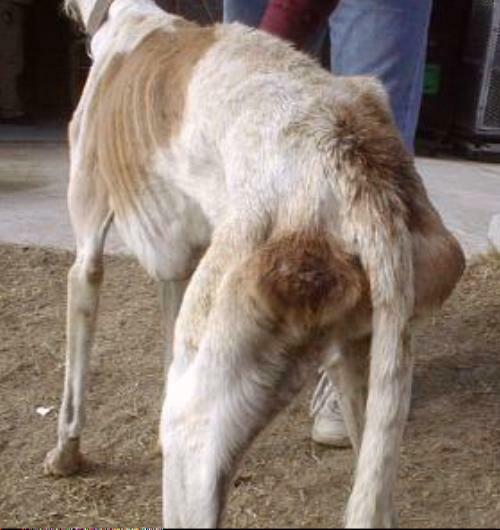 These pictures don't do justice to the dog's deplorable condition. When we rescued him, he weighed just 40 pounds. (Research of his racing records shows him racing at 65 to 67 pounds.) 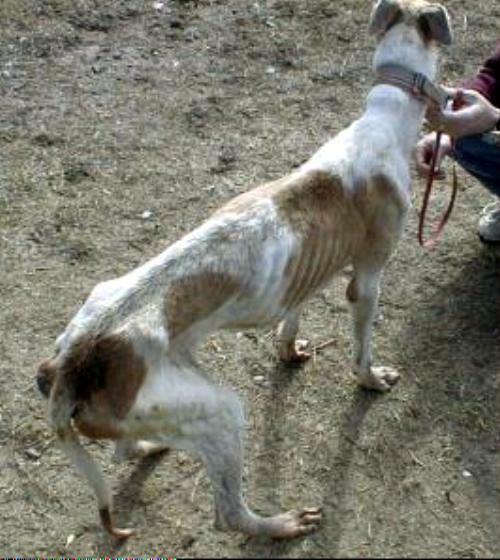 He was emaciated, covered in ticks and fleas, and had oozing pressure sores on his hips, which had abcessed and ruptured. His right front foot was so swollen and painful he could barely walk. 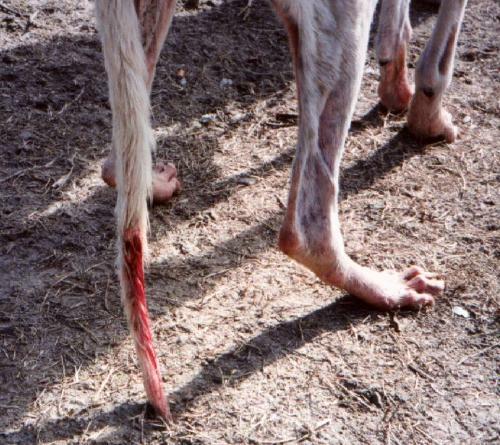 His tail had an open, bleeding wound, which dripped blood continuously. 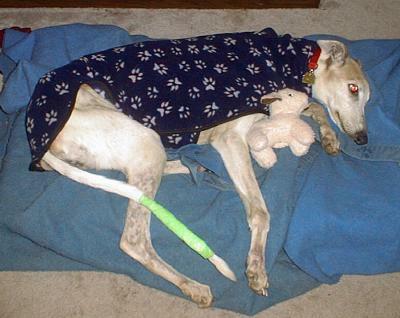 He had severe abdominal bruising - we thought possibly a sign of a tick-borne virus, but later determined that it must have been caused from a well-placed and very brutal kick to his stomach. The shelter staff was very concerned for his well-being. Apparently Obadiah had stood up for the 3 days they had him impounded. Concerned that he would not survive another night in the shelter, Animal Control let us take him out a day early - that was a FIRST! Just as we suspected, the dog was a retired racer. Research of his records proved him to be "Barry Barx," born in June, 1992 and retired in 1996. 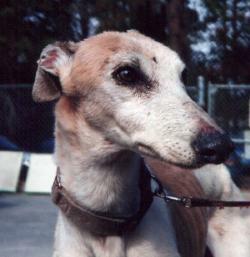 He had been adopted from a group in Jacksonville, FL. Unfortunately, because of unusual circumstances involving a prior greyhound volunteer, his adoption paperwork could not be traced. Deciding that our boy needed a fresh start in life, with no associations to anything bad or frightening, we decided to give him a new name, rather than call him "Barry" (his old call name). We renamed him "Obadiah" and began the process of bringing this poor old soul back to life. Here are some photos of Obadiah the day we pulled him from the shelter. Every rib, every vertabrae, even the bones of his tail could be seen and felt. 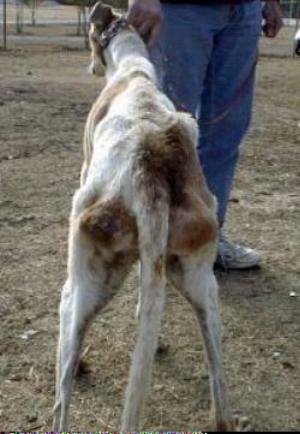 Pressure sores on Obadiah's hindquarters were caused by his pelvic bones pushing much too close to his skin. 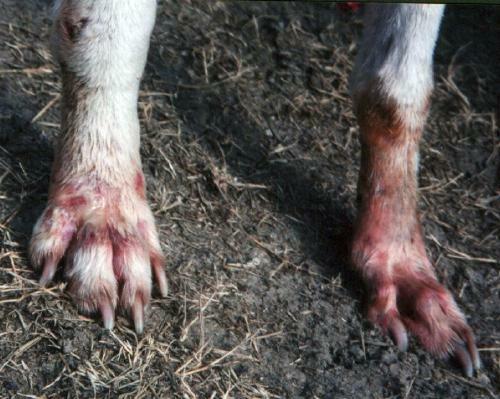 The wounds were infected, oozing pus and blood, and of course, very painful to him. Obadiah's feet were swollen and bloody, and oozed pus from every pore. He could only walk about 4 or 5 steps before he'd stumble and almost fall. This tail wound was almost to the bone. It was also infected, and bled constantly for several days after we rescued him. His tail ultimately took about 3 weeks to start healing. Our first stop upon reaching home with Obadiah was the bathtub! 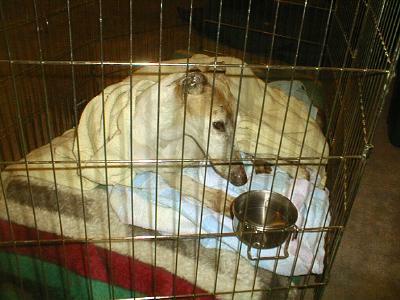 As weak as he was, he had to be bathed - the fleas and ticks were making him anemic. We stood him in the tub, but when the lukewarm water started to wash the grime and filth off him, he sank to his side and lay in the tub. While my husband held Obadiah's head out of the water, I washed one side of his body. Then we turned him over and repeated our efforts on the other side. Obadiah never tried to stand up. If we had not held his head, he would have laid it in the water and drowned without caring. Finally, clean and warm - but exhausted from his ordeal - Obadiah went to bed. The very next morning, January 15, we took Obadiah straight to the vet. 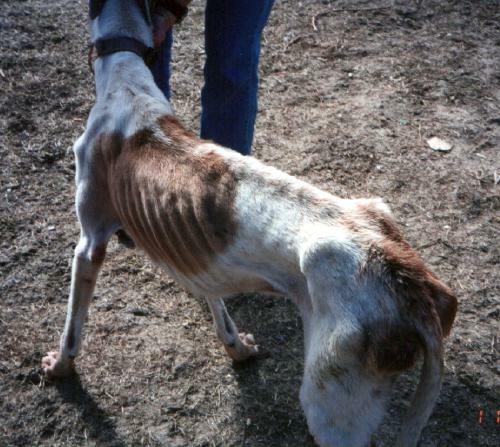 To paraphrase our vet "this was the skinniest, saddest-looking dog we had ever brought in." Obadiah was examined, checked for worms, and prescribed medications to fight the infection and relieve his pain. We tested Obadiah for heartworms and discovered he was positive. Additionally, we ran tests to determine if he had any tick-borne viruses - all were negative - and did a blood panel and CBC to ensure his liver/kidneys, etc were functioning normally. 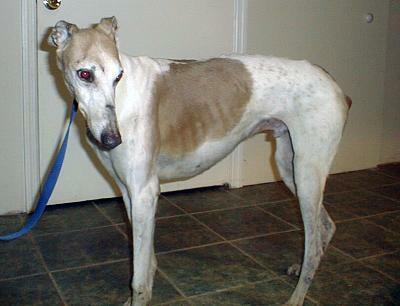 Treatment for the heartworms began as soon as he gained some weight. Over the next few months, Obadiah healed and rested. His personality surfaced, and we discovered he's quite a character! By May, our vet declared him ready for adoption! He had been retested for all tick-borne diseases with negative results, and started on Soloxine for slightly low thyroid levels. On November 17, 10 months after he was rescued from the shelter, Obadiah went home. He was adopted by John and Martha Smith, and lives in a small town just outside of Savannah. With the Smiths, Obadiah has found the home he deserves, and will be loved and cherished for the rest of his life. This was truly a week of Thanksgiving for everyone involved in Obadiah's rescue and rehabilitation. MANY, MANY "thank you's" to Pat & Howard Hall, James & Jennifer Greene, Jean Delaney, Harriet Harvey, John & Leona Carroll, the Savannah Friends of Greyhounds As Pets, Ashley & Daryl Piner, John & Jean Iaderosa, Linda Granchelli, James Neil, George & Hiroko Gray, Kerry O'Brien-McMullen, Alena Coufalova, Susan Verhault, Wayne & Janet Nethery, The Greyhound Gang (Claudia Presto), Dennis & Wally Lacey, Pam Fandrich, Lorna Cross, Ramona Liera-Schwichtenberg, Richard & Angie Royer, Paul Lee, Jan Murphy, Dave Doubek, Cynthia Cooper, Carol Jillian, Northcoast Greyhound Support, William & Marilyn Gleason, Gregg & Aaliyah Snyder, Mary Ann Protz, Mary Wicks, Mary Bauer, Elizabeth Lechner, Patty & Rose Comerford, Janelle Krusper, Judy Sparks, Cindy Czerechowicz, Janis Comstock-Jones, Stacey & Jason McCarty, Eileen Pavia, Linda Pollman, Joy Jarfors, Marilyn Hiel, Anne Littlefield, Laura Casey, Marni Reneau, Joy Riley, Geoff & Eileen Mackey, Tracey Dunham & Brian Leslie, Sherry Hall, Stephen Budney, and Bruce & Angela Curtis for their donations. Also, "thank you" to Connie & Kevin in Sarasota for arranging the for Obadiah to get new "jammies" and to Megan Robertson, who makes "Val's Pajamas" (www.valspajamas.com), for donating them; to Suzanne Palmer for the two wonderful Snugglers (see her website @ www.suzieqdesigns.com); and Lisa Lechner for the 4 beautiful sighthound collars she made for him. Last, but not least, many thanks to Renee; Kate, Sue & Ann; and Kevin for setting up several E-Bay auctions in Obadiah's benefit.